What is Bobcat Goldthwait, the veteran comedian who directed World’s Greatest Dad and God Bless America, doing behind the shaky handheld camera of a found-footage monster movie? The cynical answer would be that it’s much cheaper to film a gaggle of no-name actors sprinting through the wilderness than it is to shoot… well, just about any other kind of movie. But Willow Creek, about an amateur filmmaker who drags his girlfriend on a search for Sasquatch, may be more of a labor of love than it first appears. Last summer, during the film’s festival run, Goldthwait was quick to confess his interest in Bigfoot lore—a fanboy fascination the director conveys through interviews with real enthusiasts, who play themselves and expound on the mythology of the fabled beast. He may be seriously slumming by putting a modern spin on 1972’s The Legend Of Boggy Creek, but at least Goldthwait’s done his homework. He’s also clearly studied the most famous and effective of found-footage thrillers: The Blair Witch Project, to which Willow Creek bears more than a passing resemblance. In fact, this may be the closest any filmmaker has come to replicating the basic architecture of that 1999 milestone, beginning with an extended riff on its chatting-with-the-townies prologue. Bigfoot believer Jim (Bryce Johnson) has opted to spend his birthday retracing the steps of Roger Patterson and Bob Gimlin, the men who shot the famous 1967 footage of an ape-like creature—or, perhaps more likely, a guy in an ape costume—wandering through the woods of Northern California. Accompanied by his skeptical girlfriend, Kelly (Alexie Gilmore), Jim drives out to the titular community, the “Bigfoot capital of the world,” where he conducts interviews, visits tourist attractions, and blows off ominous warnings from the locals. As in Blair Witch, the camera creates a false sense of control and security, which Goldthwait amplifies by having his characters often call “cut!” and repeat takes—a filming strategy Jim abandons once he and Kelly are out in the middle of nowhere, at the mercy of what they’re hunting. Willow Creek has one great scene, an epic long take within the dimly lit interior of a tent. Observing his petrified lovers for a breathless, static 20 minutes, Goldthwait demonstrates how duration, off-screen sound, and the commitment of talented actors can combine to create a black hole of suspense. Unfortunately, nothing that happens afterward comes close to matching the intensity of that tour-de-force sequence. 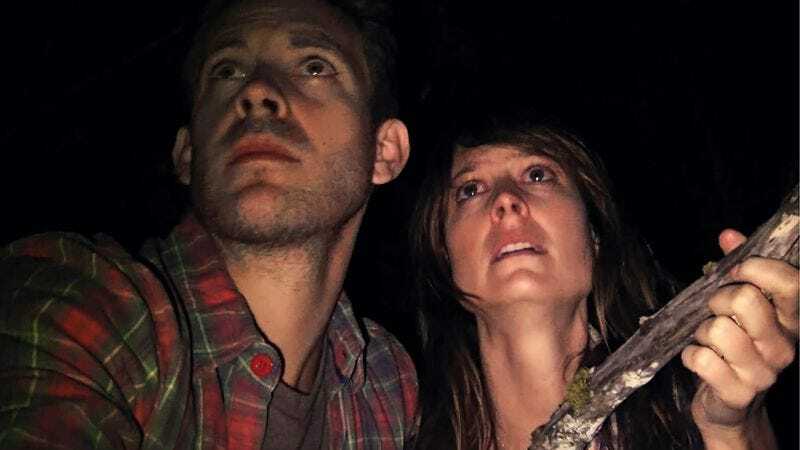 In essentially remaking Blair Witch, but with a camera-shy behemoth instead of a vengeful crone as the antagonist, Willow Creek flubs the ratio, stretching out the all-is-well prologue and condensing the nightmare-in-the-woods payoff. Goldthwait is just having too much fun with his bantering couple and the eccentric, guitar-playing Bigfoot fanatics they encounter; the climax feels like an afterthought, the obligatory mayhem he had to provide as justification for making a shaggy romantic comedy about the cult of Sasquatch. Bonafide believer though he may be, Goldthwait clearly remains more interested in folks than folklore.